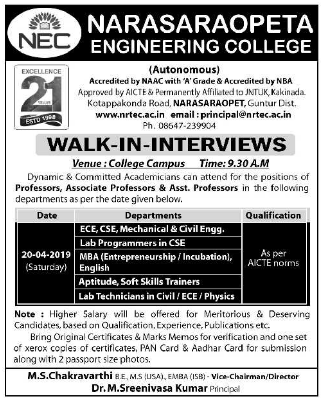 Narasaraopeta Engineering College, Guntur has advertised in the EENADU newspaper for the recruitment of Professor / Associate Professor / Assistant Professor Plus Non-Faculty jobs vacancies. Interested and eligible job aspirants are requested to attend the Walk-in on 20th April 2018. Check out further more details below. About College : With the motto of providing Quality Education, and the vision of creating the path to excellence, Narasaraopeta Engineering College (NEC) was established in 1998 and sponsored by Gayatri Educational Development Society (GEDS). NEC is approved by AICTE – New Delhi, the highest sanctioning authority of Government of India, has permanent affiliation to JNTUK and accredited by NBA, an autonomous body of AICTE. Narasaraopeta Engineering College (NEC) is located in the suburbs of Narasaraopet, popularly known as ‘The Gateway of Palnadu’, a town with more than two hundred years of history, and surrounded by famous religious places like Kotappakonda, Guthikonda and Chejarla. The college is approximately 40 kms from Guntur and the closest airport is about 100 kms, which is in Gannavaram, Vijayawada. How to Apply: Interested and eligible candidates are requested to attend the Walk-in interview along with CV, originals and copies of certificates, marks memos, PAN card, Aadhaar card and 02 recent colour PP size photos to the following walk-in address.